After our terrific start to the season, the game against Spurs had to be considered as a free hit and I have to confess that I travelled without either hope or expectation of anything from the game. The travelling part had challenges with a strike on South West Railways, the closure of Euston and a partial closure of the Metropolitan line. But, despite my concerns, it turned out to be an easy enough journey and, in contrast to last week, the walk to the West Herts was in blazing sunshine. When I arrived, the food service had not yet begun, but I put in my order for the jerk chicken. It took about an hour and a half to arrive, but was well worth the wait. Last week had been more of a barbecue version, this week it came fresh from the grill with proper jerk seasonings and a good helping of rice and peas. Just gorgeous. We noticed that the clock in the club was an hour slow, which helped us with the 4pm kick-off as we just kept to our usual matchday schedule. Team news was that Gracia had stuck with the same team for the fourth league game in a row, so the starting line-up was Foster; Holebas, Kabasele, Cathcart, Janmaat; Pereyra, Capoue, Doucouré, Hughes; Deeney, Gray. Tottenham launched an early attack as Kane found Lucas in the box, but Kabasele continued his great performance from last week with a lovely saving tackle. With little in the way of action on the field early in the game, the 1881 amused themselves with a chant of “Milton Keynes, you’re having a laugh” in reference to the fact that Spurs have applied to stage our League Cup game at the stadium that must not be mentioned (booooo). The next chance for the visitors came as Alli got on to the end of a long pass from Alderweireld which he headed over both Foster and the bar. Then Janmaat crossed for Deeney but, again, the header was over the bar. Tottenham threatened again as a through ball released Lucas but Kabasele was on hand to disrupt and Foster was able to gather the ball. There was another chance for the visitors as Foster failed to control a cross from Eriksen, Kabasele’s attempted clearance fell to Lucas but the shot was well wide of the target. Then a free kick was played back to Eriksen whose through ball was turned just wide by Alli, who was offside anyway. A corner from Eriksen was headed clear to Davies whose shot flew wide. Tottenham’s final chance of the half came from a Vertonghen cross that was headed over by Sánchez. 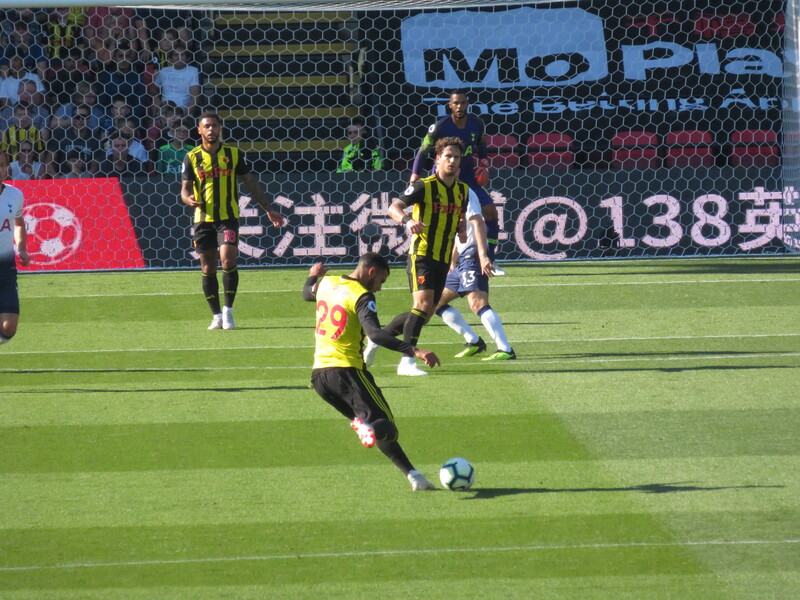 In time added on, Watford finally launched another attack, but Deeney’s shot from distance was weak and easily gathered by Vorm. So we reached half time with the game goalless due to a decent defensive performance by the Hornets who had restricted the opposition’s chances without posing much of a threat themselves. The half time interview was with Ben Wilmot, still basking in the glory of his magnificent performance against Reading in midweek. I look forward to seeing him develop as, at 18, he already appears to have Cathcart levels of assurance, which is a great thing. The first chance of the second half fell to Eriksen, whose shot just missed the target. The Dane had another chance soon after, but his shot from distance was easy for Foster. 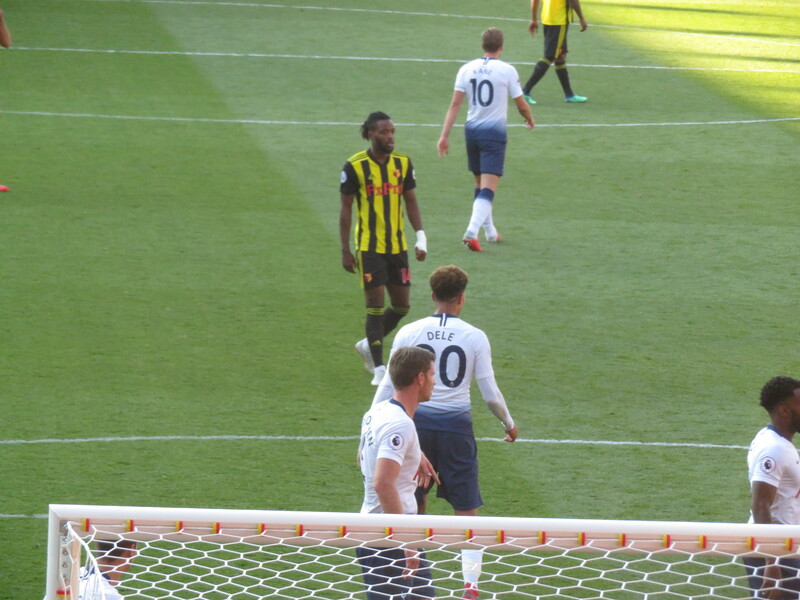 The first booking of the game went to Capoue for pulling back Vertonghen. The visitors took the lead in the 53rd minute. It was a scrappy goal that took a deflection off Doucouré and flew past Foster. There was a certain inevitability to the goal and we settled back to witness the defeat that was sure to come. But the players were of a completely different mindset and the goal seemed to galvanise them into action. First Gray hit a powerful shot that was just over the bar. 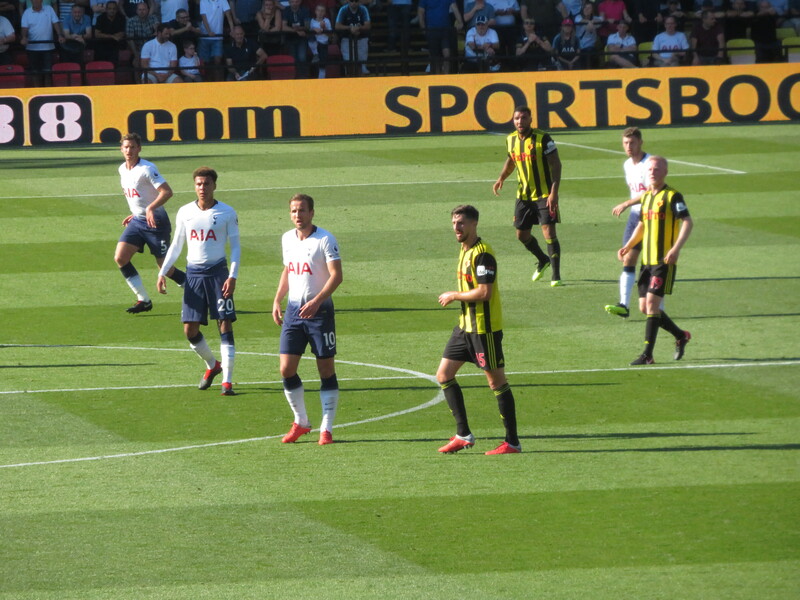 Then Deeney hit a shot across goal that took a deflection off Vertonghen before coming back off the inside of the post. So close! Spurs were rattled and Dembélé went into the referee’s book for pulling down Hughes. Holebas took the resulting free kick which was met by Deeney who powered the header home to level the game and send the Rookery wild. Gracia made an immediate substitution bringing Success on for Gray, I have to say that I wasn’t convinced that this was the correct move. What do I know? Watford continued to threaten as Janmaat crossed for Pereyra who headed the ball just wide. 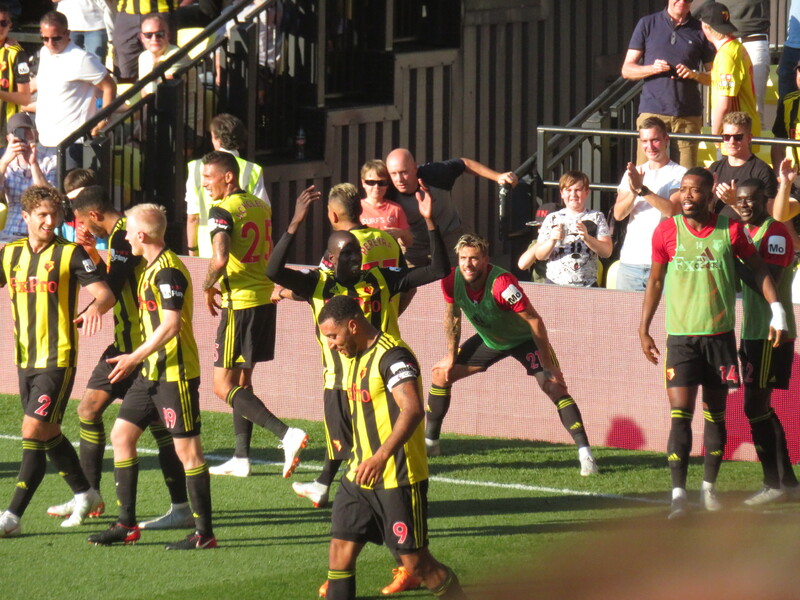 Watford’s second goal came from another assist by Holebas, this time from corner and it was Cathcart who rose to head home. I love Cathcart. He calmly gets on with his job in defence, never drawing attention to himself until he pops up in the opposition box to put the Hornets into the lead against one of the best teams in the country. Spurs made their first substitution replacing Alderweireld with Llorente. They had a decent chance to strike back through Eriksen who tried a shot from distance, but Foster was equal to it. 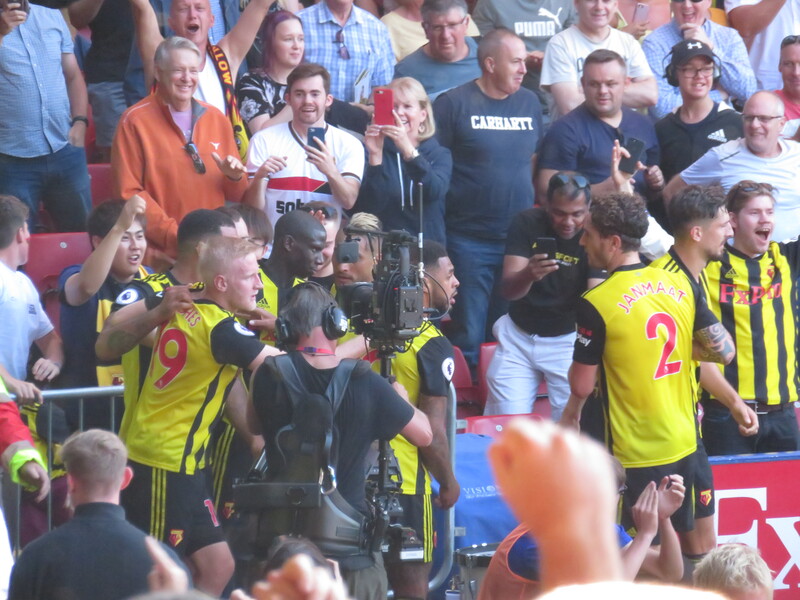 Into the last five minutes of the game and there was a substitute for each side as Hughes made way for Chalobah, a change that was greeted with loud cheers for both players, and Winks replaced Dembélé for the visitors. From the Rookery, I was convinced that Spurs had scored from their next attempt, but Kane’s header had flown over the bar and hit the outside of the net. Each side made a final change with Rose coming on for Davies and Mariappa replacing Pereyra. In the last minute of time added on, Spurs won a free kick in a dangerous position. My heart was pounding as it was taken and there were loud cheers as it deflected for a corner. The cheers were even louder when the corner dropped to Rose and he belted the shot well over the bar. The final whistle was greeted with a roar from all the stands. Elton and his boys were celebrating in the Upper GT and we were all joining Capoue in a celebratory dance. Deeney won a well-deserved man of the match award. It is only a couple of months since a number of Watford fans were saying that he was past his sell-by date. How wrong they were, we wouldn’t be without him now. It was a terrific team effort and, based on the second half performance, we thoroughly deserved the win. As one who was lucky enough to live through the first GT era, I can be a bit blasé about these results, after all I have seen us beat Spurs 5-1 at White Hart Lane. But reading the reactions of my Watford friends to this result shows how much this means. Watford are currently joint top of the table with 100% record and looking like a team who will be a tough prospect for anyone this season. It was all smiles as we met up after the game. But there was only time for a quick drink and then it was to the Palace Theatre for the first Tales from the Vicarage Captains evening. It was much more low-key than some previous events, but an absolute joy to hear Wilf Rostron speak. 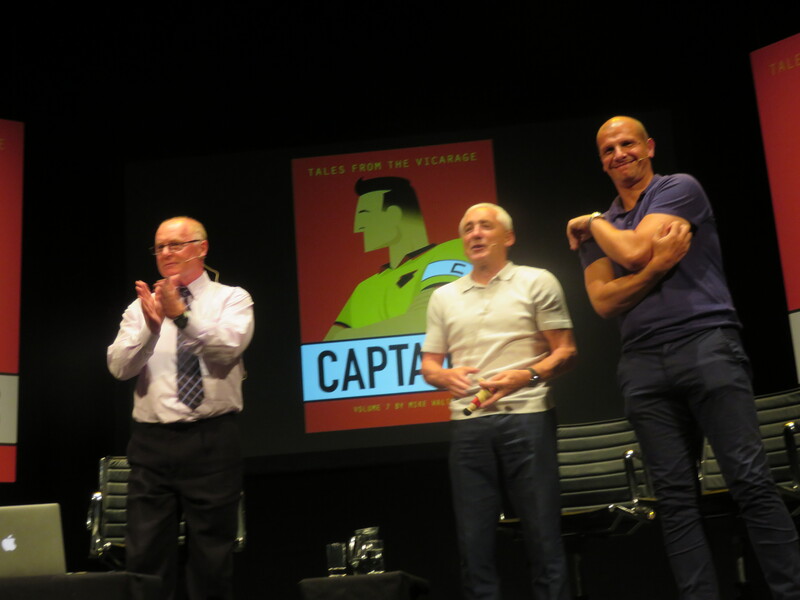 I had heard that he had fallen out of love with football, so it was lovely to hear him speak so warmly of his time at Watford and the way that he, and particularly his wife, Jill, had been welcomed to the club. Obviously, the sending off that meant he missed the Cup Final came up, but he is philosophical about that now (I am not, angry tears were still pricking my eyes as he spoke). He looks incredibly fit and said that (at 61) he plays in an over-40s league. Similarly, Les Taylor says that he achieved all of his footballing dreams at Watford, including leading the team out at Wembley in place of Rostron. His talk of hitting the Watford Observer clock made me smile as I remembered his shooting exploits. Neil Cox had a more challenging time, not seeing eye to eye with either GT or Vialli, but he will always be remembered as being the captain that convinced his players to agree to a wage deferral when the club were in trouble. Graham Simpson did not come out of that one well as he tried to avoid paying the players back the money they were owed. A reminder of less pleasant times at the club. As always, it was a wonderful evening that evoked many happy memories. Since the Pozzo take-over and the influx of players from all over the World we have often been told by those outside the club that these “foreigners” don’t care about the club or the fans and this is not the Watford that we all grew up with. On social media on Sunday night, there were two examples that showed that this is far from the truth. First was a video of Roberto Pereyra meeting a young fan with Down syndrome. To see Roberto interacting with this youngster brought tears to my eyes. He may not speak a lot of English, but his actions spoke volumes and the boy was beaming. Then I saw that young Lexe Allaway had received Jose Holebas’s shirt after the game. When her Mum was asked how this had come about, it seems that they had met a day before the Palace game and Jose had said he would meet her after that game to give her his shirt. True to his word he met her, but as he had scored from that ‘cross’ he asked Lexe if she minded if he kept the shirt. Of course, she was more than happy for him to have it after his wonderful goal, and he promised that she could have his shirt the following week. Her Mum warned her that he may well have forgotten a week later. Instead, true to his word, he waited for her after the match, handed her the shirt and made time to chat to her about her football. Jose has a (well-deserved) reputation for being a miserable so-and-so, but to show such kindness to a young fan is a measure of the man and he has gone way up in my estimation. I grew up supporting a wonderful club that gave us many happy memories on the pitch, but was a club where the fans were treated well and appreciated by the players. I am so delighted that, even though football has changed massively over the past 30 years, the current generation of youngsters are having the same experiences that we did. Watford truly is a special club. 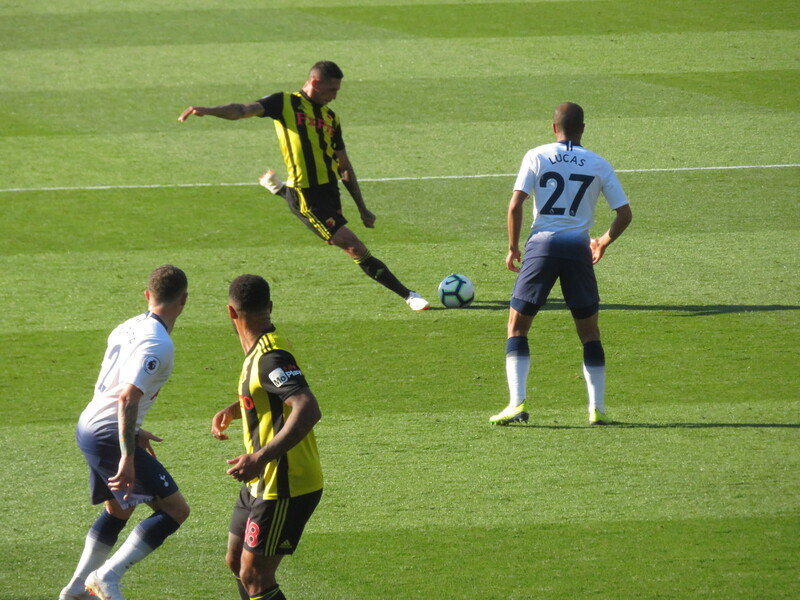 This entry was posted in Watford FC and tagged Abdoulaye Doucoure, Adrian Mariappa, Andre Gray, Ben Davies, Ben Foster, Christian Eriksen, Christian Kabasele, Craig Cathcart, Danny Rose, Daryl Janmaat, Davinson Sanchez, Dele Alli, Etienne Capoue, Fernando Llorente, Harry Kane, Harry Winks, Isaac Success, Jan Vertonghen, Javi Gracia, Jose Holebas, Kieran Trippier, Lucas Moura, Mauricio Pochettino, Michel Vorm, Mousa Dembele, Nathaniel Chalobah, Roberto Pereyra, Toby Alderweireld, Tottenham Hotspur FC, Troy Deeney, Watford FC, Will Hughes on September 3, 2018 by franelynn.